Blackberry is all set to race against the big names in the industry. The company might launch its first bezel-less phone going by the name ‘Ghost’. Blackberry licensee Optiemus disclosed that the company is in plans to launch two new Blackberry devices in India. Optiemus takes care of manufacturing and designing of blackberry phones in India, Sri Lanka, Bangladesh and Nepal. The phones will feature the same security options that have become the USP of blackberry devices. Keeping aside these two phones, the company is even planning to launch more devices in India. These devices will be available in different price segments, releasing in different quarters. With all these new Blackberry devices in the market, Optiemus is looking for a 10-12 percent market share. The share is expected to be in different price segments. Hardip Singh, Executive Director at Optiemus told “We are going to come out with a whole range of models starting with two this quarter. And during the year, we have more models planned out in the coming quarters. We have a strong pipeline of models which we will be bringing in and they will be at various price points”. We have been seeing a few leaks which started coming as early as February, one of which comes from the much known Evan Blass. 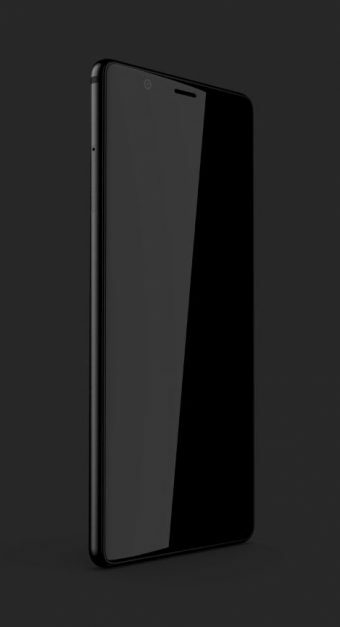 Blass released a render of the Blackberry Ghost in one of his tweets. The render shows that the new blackberry flagship will feature a new 18:9 aspect ratio display. While, the second render by Evan Blass might be the Ghost Pro which seems to have a wider and shorter form factor, hinting a 16:9 display. However, the hardware specifications of the devices are not yet known. But the devices are expected to feature top-end hardware coupled with additional Blackberry security features. Optiemus has confirmed that upcoming devices will come with the DTEK app which monitors the security of the device in real-time. They will also have the Blackberry Hub that brings all communication in one place.